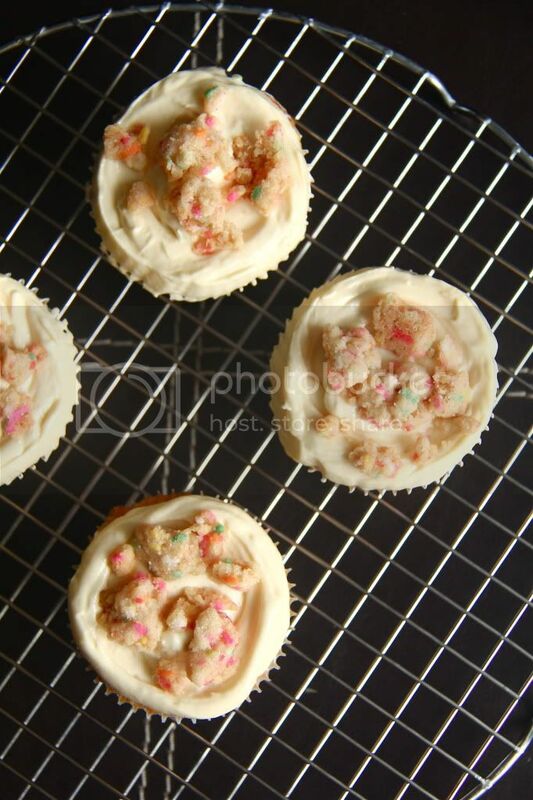 Crumbs and Cookies: birthday cake cupcakes. The momfuku milk bar cookbook is to me what Willy Wonka's chocolate factory is to chocolate fanatics. It's a playground of wonderful ideas that never cease to excite me. Like seriously, blueberries and cream cookies? Cereal milk panna cotta? Ritz crunch? And did I mention, the most festive looking birthday cake ever? Confetti never fails to add to the party atmosphere, I swear. And dedicating a whole cake to those sprinkles is like a dream come true to me! As much as I wanted to follow the recipe in the book, it was way too complicated and cumbersome. 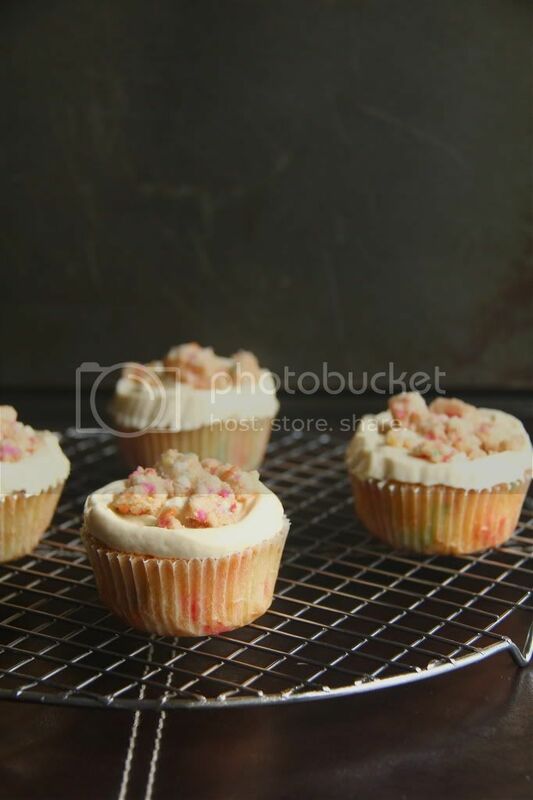 Instead, I decided to take a basic vanilla cupcake and throw in some sprinkles into the batter but I stuck to the accompanying birthday cake frosting and addition of birthday cake crumb(!). If you would like to view the original recipe, please head over here. 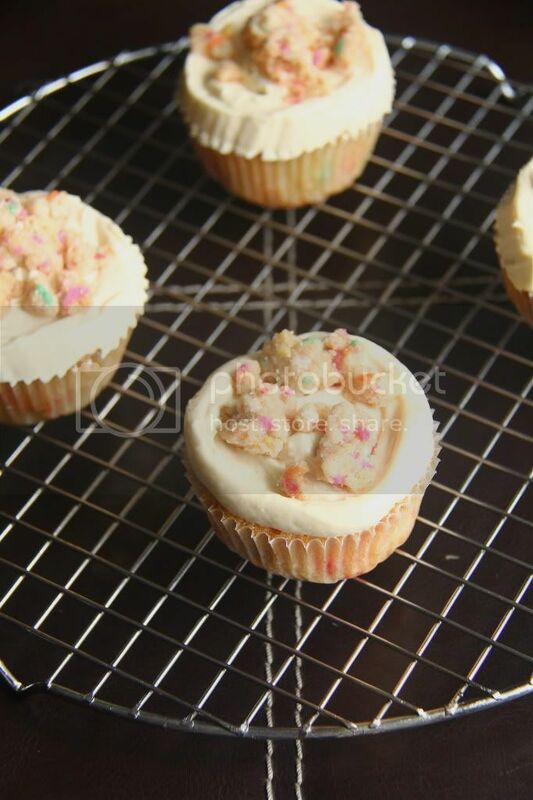 By the way, this is by no means my favourite vanilla cupcake yet. I've gathered a few potential recipes and I'm planning to bake them all and do a comparison. This one is just one of them. Although, I must say that this recipe has already lost some points on the looks scale because after baking, the crust is rather moist and sticky. Rather unappealing, if you ask me. The birthday cake frosting was glossy, light and fluffy. It melts on your tongue. Unfortunately, it's quite sweet. Not the sweetest frosting I've ever had but it could potentially put off some people. There's not much I can do about it, since it is a icing sugar based buttercream. Cupcakes are so adorable! I should really make more of them. Preheat oven to 350F. Line muffin tins with paper liners. In a small bowl, combine sugar and seeds from the vanilla bean. Using the back of a spoon or your fingers, rub them together to infuse the vanilla flavour into the sugar. In another bowl, combine the cake flour, baking powder, baking soda and salt. Add in the sugar and mix until uniformly combined. Cut in butter until you achieve a fine crumb texture. Whisk together eggs, sour cream, oil and vanilla. Add the egg mixture to the flour mixture until just combined. Gradually add milk until just combined. The batter will be quite liquid. Stir in sprinkles. Divide the batter among the paper liners and bake for about 14 minutes or until a skewer inserted comes out clean. I did not follow the recipe exactly. Firstly, I replaced the shortening with butter and secondly, I omitted the salt and citric acid. That's because I don't think there's a need for salt in frosting and I didn't have any citric acid. I guess the use of shortening is to make the frosting appear whiter but shortening isn't so appealing to me. If you're concerned about aesthetics, stick to the original recipe. I already knew that my frosting wouldn't be as white as it should be as I didn't use a clear vanilla extract. P.S. Isn't baking powder in a frosting a little weird? Why is it in there? Combine the butter, shortening and cream cheese in the bowl of a stand mixer fitted with the paddle attachment and cream together on medium-high for 2 to 3 minutes, until the mixture is smooth and fluffy. Scrape down the sides of the bowl. With the mixer on its lowest speed, stream in the glucose, corn syrup and vanilla. Beat on medium-high for 2 to 3 minutes, until the mixture is silky smooth and a glossy white. Scrape down the sides of the bowl. Add the icing sugar, salt, baking powder and citric acid and mix on low speed just to incorporate. Crank the speed back up to medium-high and beat for 2 to 3 minutes, until you have a brilliant stark white, beautifully smooth frosting. It should look just like it came out of a plastic tub at the grocery store! 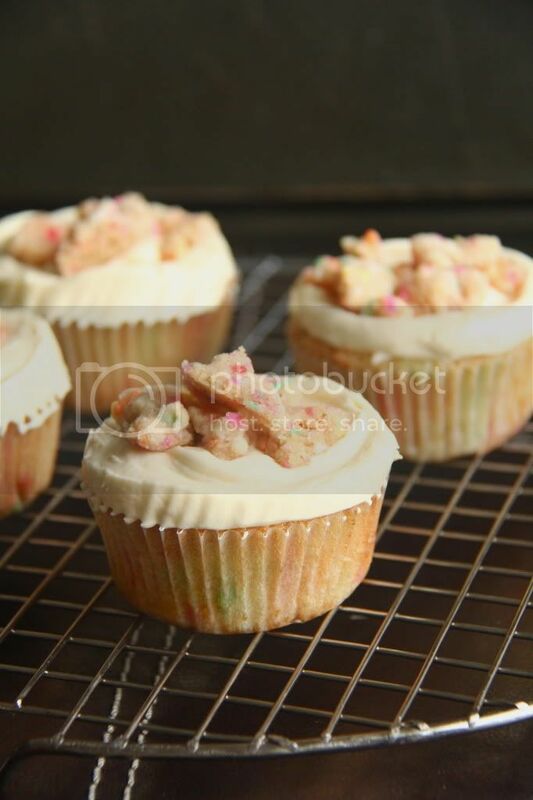 Use the frosting immediately, or store it in an airtight container in the fridge for up to 1 week. momofuku is amazing. i love all of their recipes. this one included- i hadn't heard of it before, but your cupcakes look wonderful! p.s. i'm a new reader and i seriously love your blog. you're 15?! that's insane. i'm 16 and i'm afraid to make macarons. and you already made them several times. innnnsane!